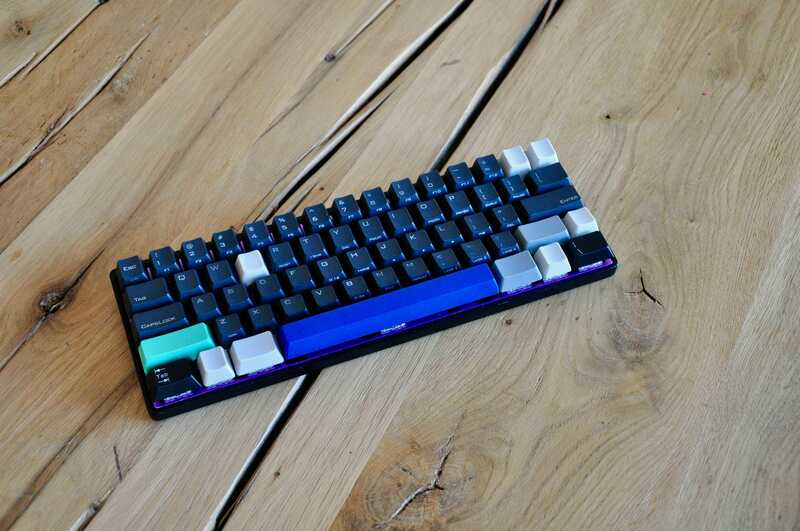 Katana60 is a symmetrical row staggered PCB that is compatible with standard 60% keyboards and standard keysets. 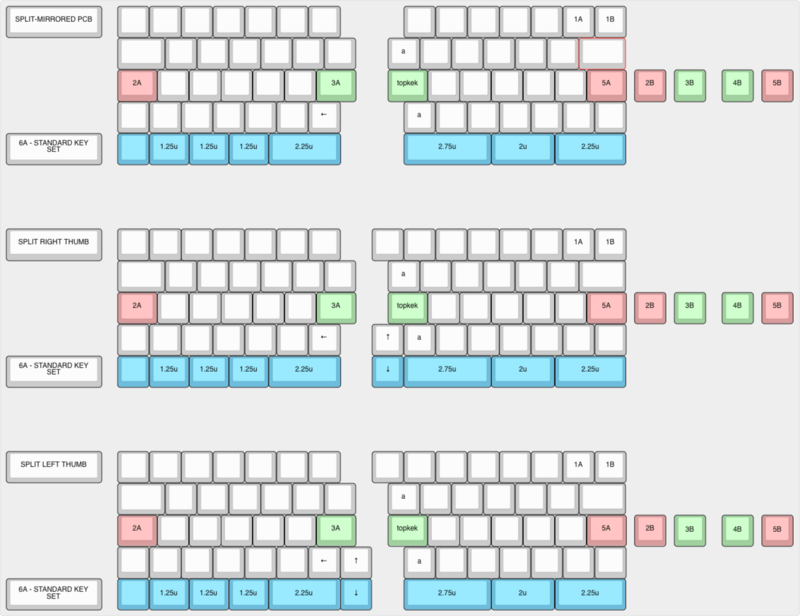 You can use Matias/ALPS switches in any of the compatible layouts, and there is a layout which is compatible with an AEKii keycap set. 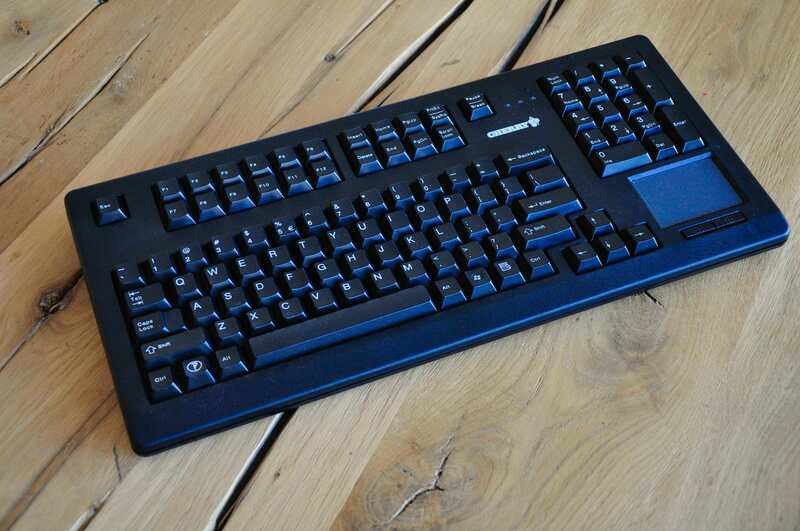 The idea of the compatibility layouts is to reduce costs when it comes to hunting down keys for your new board. This image illustrates the multiple bottom compatibility options available on the PCB. The MX and AEKii labels are a guide - you can use whichever layout you want with any switch type, though in order to use the AEKii compatible stabilisers, you will need to get your own plate cut. The board is symmetrical row staggered, which is great if you're a touch typer and/or you use Dvorak/Colemak layouts, or any other layouts optimised for maximum home-row time. The idea here is that you rarely need to move your hands from the home row, making it more efficient and ergonomical. 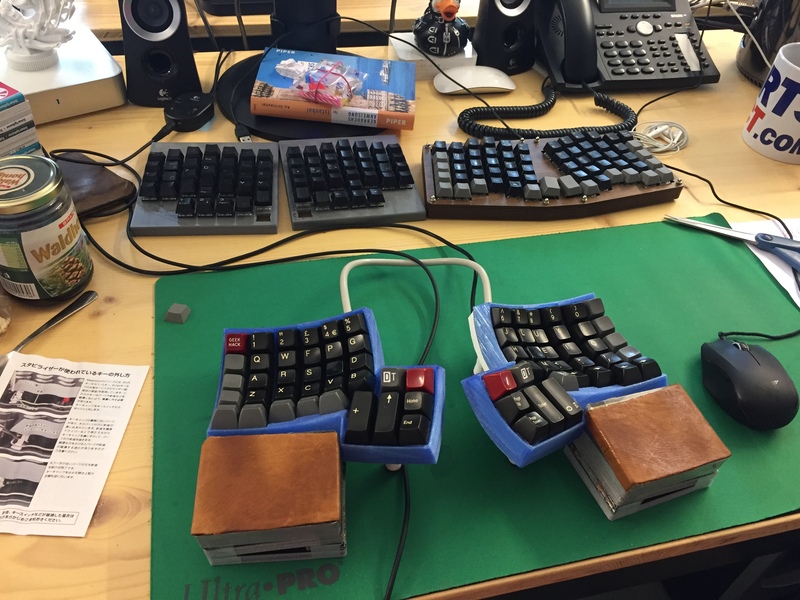 Many ergonomic keyboards on the market tend to be expensive, require completely custom keycaps sets (adding to the cost) and have an odd shaped case. Trying one without being sure if you'll like it requires a leap of financial faith. The Katana60 will be cheaper to try, and you can choose one of many 60% cases, giving you a lot of customisation choice. The PCB and universal is currently being quote up and prices will be revealed soon. I welcome all of your feedback, please leave your comments below. 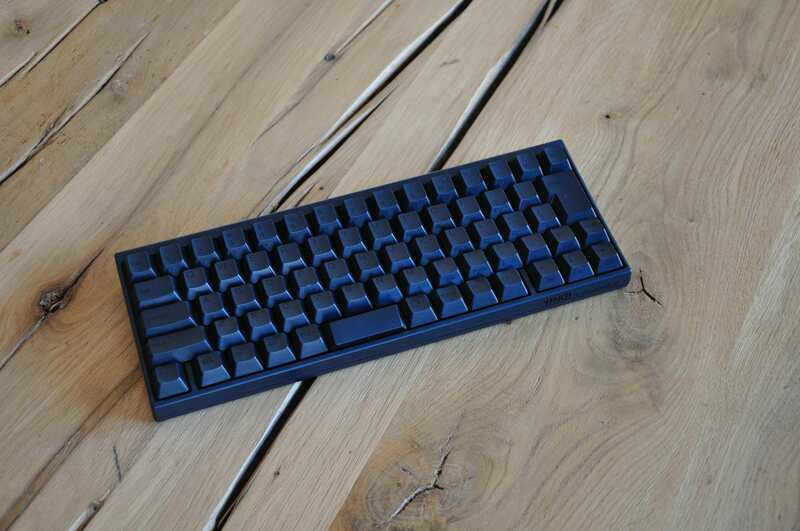 I'm gauging interest in a PCB for a 60% board with a symmetrical row stagger (a more natural slant for the left hand). The PCB will fit right into 60% cases, and will come pre-soldered with microcontroller (atmega32u4) and diodes - all you need to do is add switches. Above is an example layout that I'm using in a hand-wired prototype board right now. 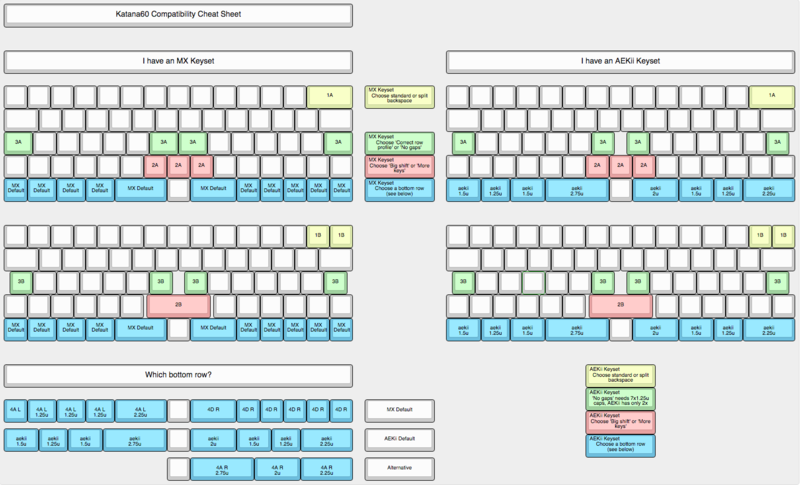 * Symmetrical layout, for a more natural (ergonomic) key arrangement than legacy layouts. 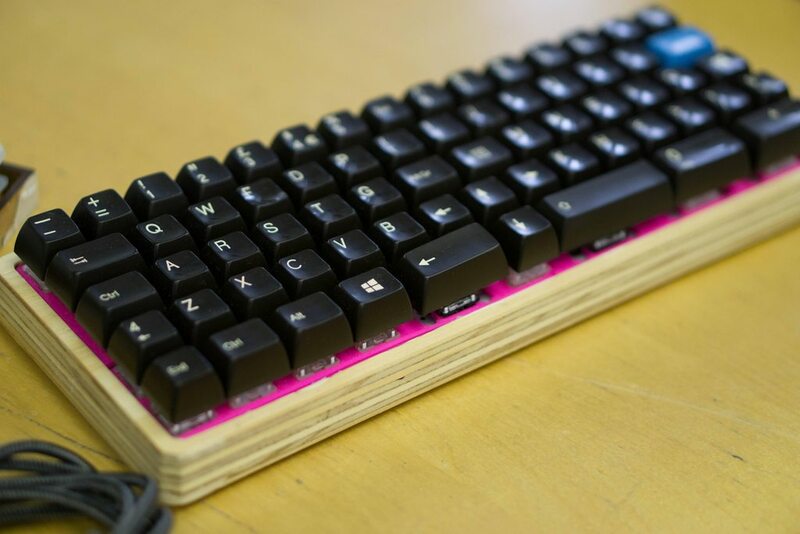 * Support for standard ANSI keycap sets - you don’t need any special keycaps. * Support for qmk or tmk, with an atmega32u4 microcontroller (found on teensy 2.0 and pro micro). * Support for poker style 60% cases. * Support for Cherry MX AND Matias/ALPs style switches. * All components will be presoldered - just add switches and caps. * Switch plate style (which layout, universal switch cutouts?). 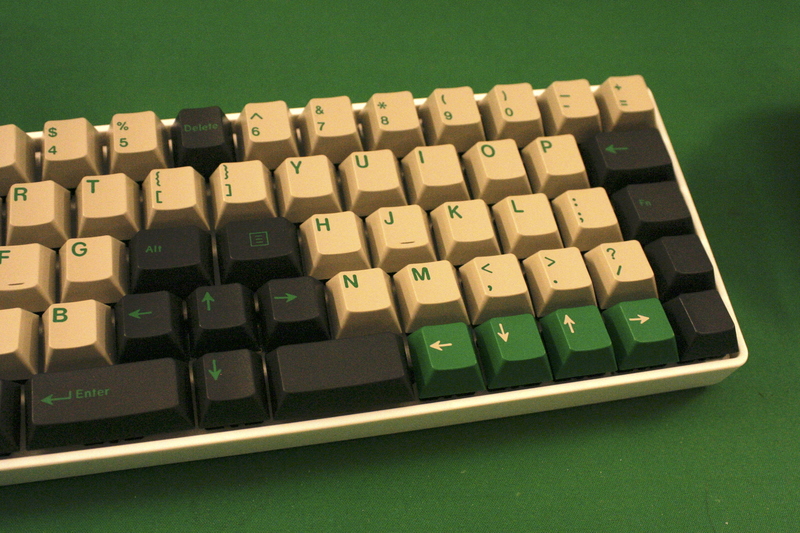 The layout features symmetrical staggered rows, like the utron, suka's hypermicro or a number of bpiphany’s boards. 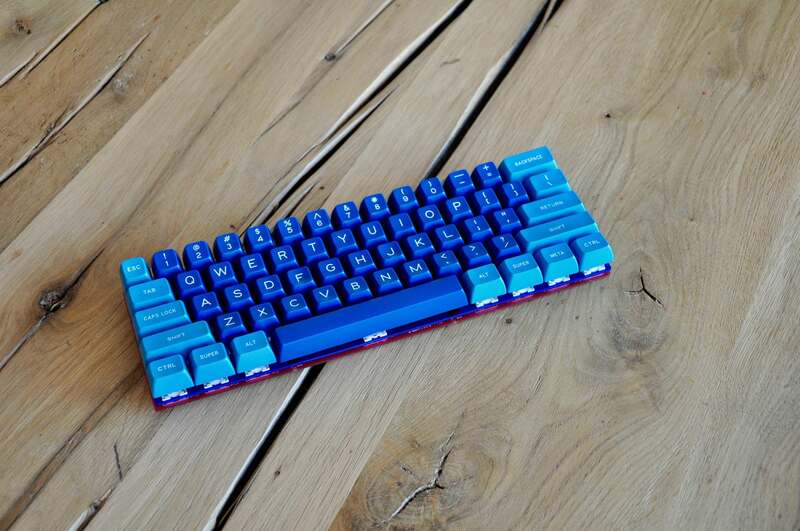 Unlike these boards, a standard ANSI keyset is all you need to cover this layout. 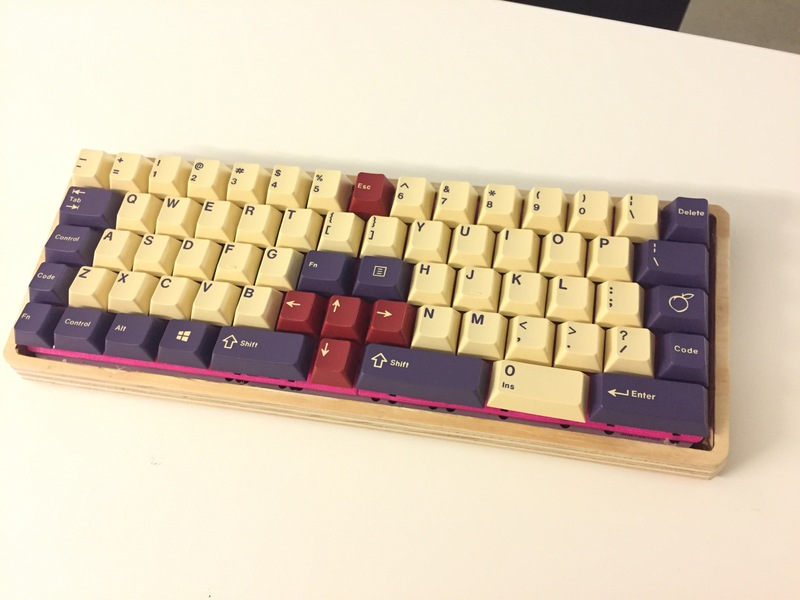 This is by design, as it allows you to cheaply buy in to any attractive keyset group buy. The PCB will include an atmega32u4 - the same microcontroller found in the popular Teensy and Pro Micro boards, so its compatible with TMK and QMK firmware. If you’re interested in either 1. the PCB, 2. the switch plate or 3. both, please reply, saying which. I'll add the names to a list (and may or may not create a form for you to fill in). Huh. Definitely interesting. I would love to see a wrist wrest made to help with hand orientation for this layout. How have you found the placement of the arrow keys to work out for you? I could only see myself hitting backspace and spacebar out of habit. But I guess as long as you are used to the layout, it wouldn't be that bad. Moved to the Interest Checks sub-forum for better visibility. I like it and would like to try it for a week or two, but not sure I'd switch to it. Still, very glad your trying this out. Nice feedback so far, thanks. I received the components for the first PCB today, I'll solder it up when I have the time and feedback on how it went. Hopefully before Easter weekend? Huh. Definitely interesting. I would love to see a wrist wrest made to help with hand orientation for this layout. How have you found the placement of the arrow keys to work out for you? ... I guess as long as you are used to the layout, it wouldn't be that bad. 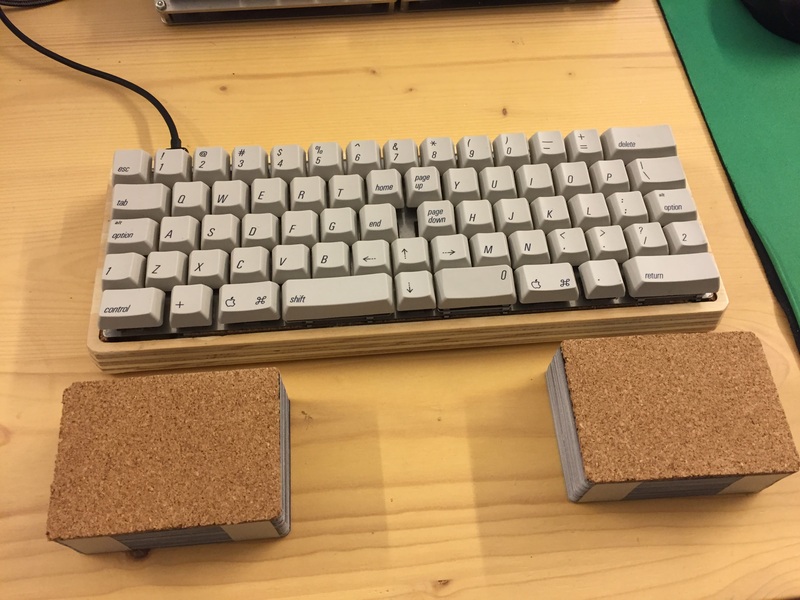 Here is an image with prototype wrist rests. I switch between using them and not. Re: the arrow keys - you said it; you get used to them. I mean, I have arrows on a function layer anyway, so I only need those for shortcuts or when I'm scrolling one-handed around a window. Thanks, I updated the title too! <- has this emoticon ever been more appropriate? Have you thought about using a concave wrist wrest to kind of funnel your hand position. I feel like my biggest issue with a layout like this would be establishing a home position and utilizing it consistently. The homing key bumps are still the best way to get your fingers into the right position, the aekii caps have the bumps under the middle finger (non-standard). 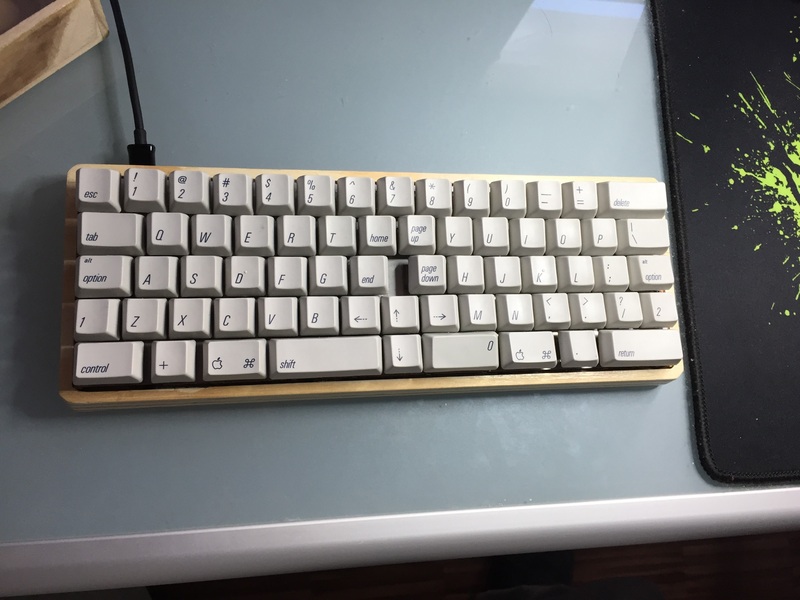 I'm using both boards (with the same layout), and don't have trouble adjusting. As for a concave wrist rest - yes, I often prop the wrist rests up to get that slight angle. I find that a comfortable position to work in. I did the same thing with my Dactyl - note there's also a reverse angle. That's inspired by the logitech g13 gaming pad rest - one of my favourite rests for comfort. so this will fit normal poker cases then? excited for the pcb and the plate gb! did some muckng around on KLE to see how a split would look like.. The first one would enable the development of symmetric pcb and plate (?) between the two halves, but leaves gaps between the halves. For the second and third ones, I'm kind of torn between giving the left half or the right half more keys. Not to mention the '6' key debacle. I'd be very interested to see how I type on this. The alphas are interestingly slanted inward, but still not ortholinear. I could say I'm hesitantly in. Since this is now in the interest check section, I thought I'd update the intro to read a bit better. Also, I added an interest list, please comment if I read your replis incorrectly! can you move me to the 'yes' section? thanks! Yeah I know it's not for the current gb, maybe will handwire it myself hahaha. The ve-a esque split is cool too but unfortunately not my cup of tea. To clarify, I'm interested in both the PCB and a switch plate. It's a great design. Typewriters (which obviously required having a stagger) should have been designed like this in the first place. Have the N and M keys been switched intentionally? I can see the advantage, the more common N key would be easier to hit the way you have it, but it is non-standard Qwerty. Interested. I'm using Angle-wide mod on the standard keyboard, so my left hand is already trained for the new ergonomic position. Don't you think about continuing the same symmetric stagger to the numbers row? 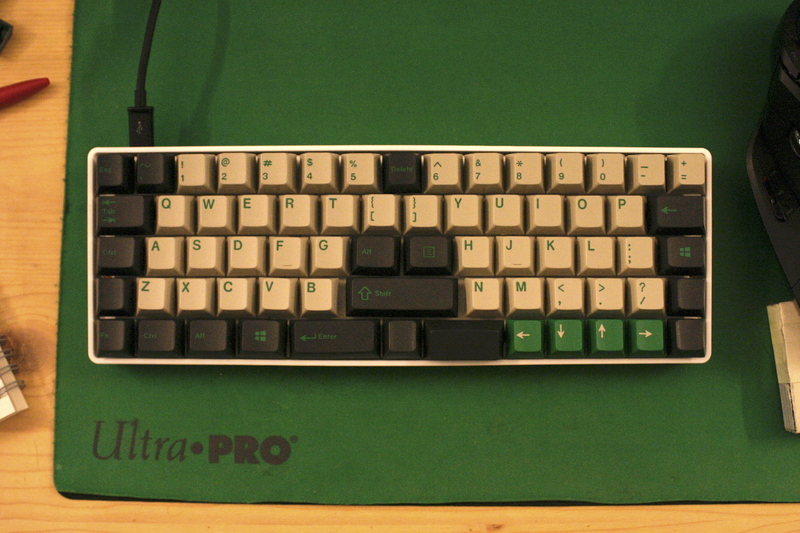 If it supports PCB-mount Cherry MX and ships from within EU, I'm in for the PCB. Oh btw, interested. Pricing estimate? with hypen and equals located above the two bracket keys. Shouldn't be a big deal. According to the OP, the PCB will be fully programmable, so that is just a programming change. Layout wise though, that does make sense to me. Almost wonder what it would be like to have the 6 next to the T and the 7 next to the Y. Basically swapping those two positions with the bracket keys. Does that mean it's still happening? The project isn't dead, but I have been very busy at work. I'm on holiday for the next two weeks, I'll post an update after I return. Can't wait! You can mark me as interested!! This layout makes a lot of sense to me. I'd like something that avoids so much twisting of the left wrist. I'd be interested in this, but I'm more interested in a split option. I'm worried that I won't be able to overcome 25 odd years of muscle memory so the more radical split version might be different enough that muscle memory won't apply so much. Is the plate material decided? Will this support lighting and underglow? Not something I need, but it seems to be demanded more and more within the mech community. 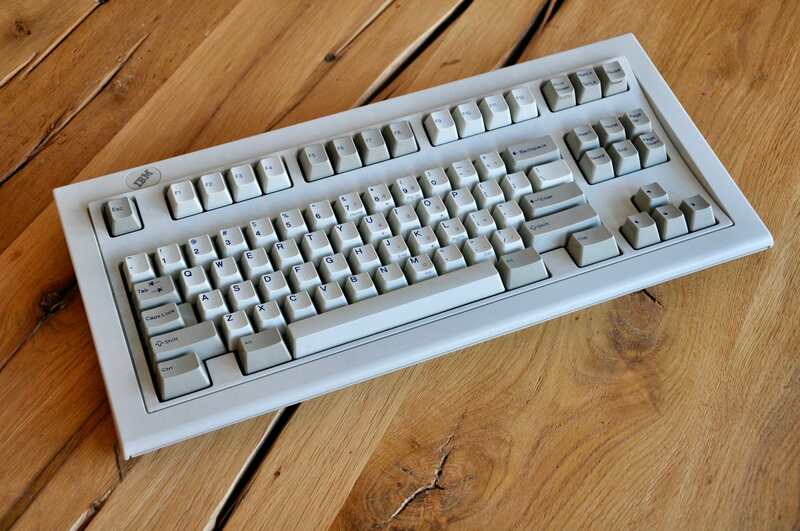 Is there any downside to supporting Alps and MX? Many projects don't, I just wondered why if it's possible? Is this likely to be manufactured in Europe? Is there an estimate for the expected cost? edit: with 2b, 3b, 4b & 5b there's gonna be an option for another 1u switch between 3b and 4b, right? or how is that thought out to be? 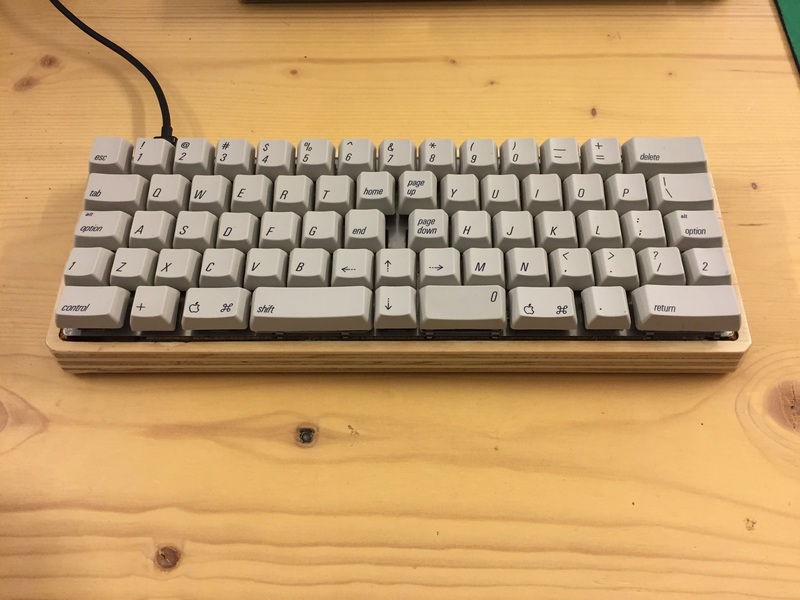 Interested in having an Alps board like this! I'm very interested in both the pcb and plate. This is a really neat layout. I hope it gets more exposure and testing done. This is exciting, you have our full backing for support! I like the concept, I'm a definite maybe. Will be watching, and although It's probably too far progressed at this point I wondered about the 1u shift being too small - ANSI users often point to the left shift on ISO as being too small and too far to reach. I wanted to ask if you were fixed on the 60% size, or if a variation with wider modifiers had been considered? which would of course mean the width ends up a little nearer 65%. ANSI users often point to the left shift on ISO as being too small and too far to reach. I wanted to ask if you were fixed on the 60% size, or if a variation with wider modifiers had been considered? which would of course mean the width ends up a little nearer 65%. This is definitely intended for a 60% case. 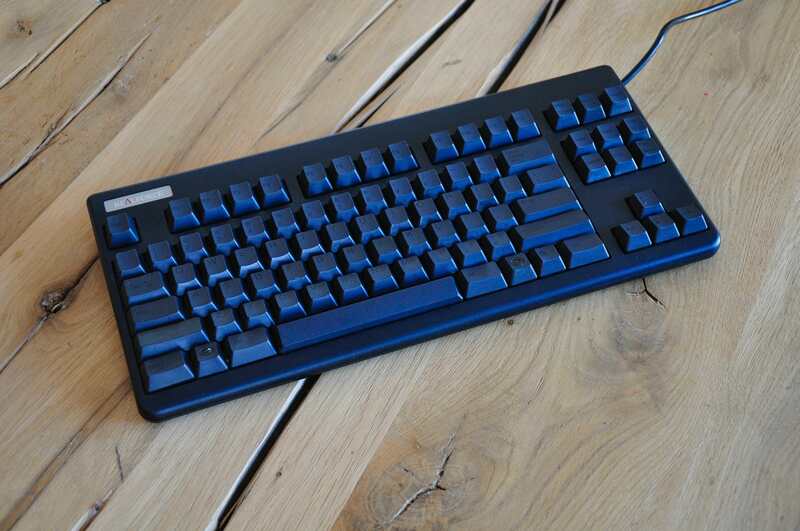 The Katana60 is different enough from a conventional layout, that a 1u shift key will really be the least challenging thing to get used to. 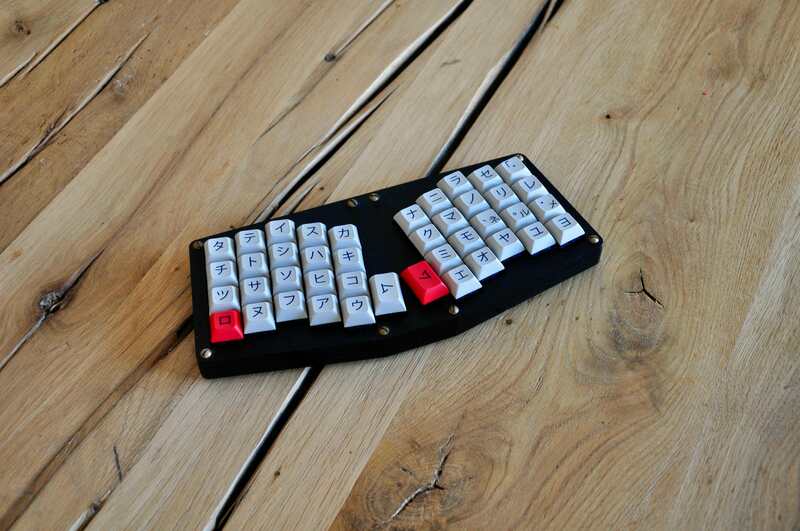 I'd like to re-emphasise that last phrase: '...get used to' - you will get used to the layout after a while, just as ergodox users got used to their wildly unconventional layout, and Planck users theirs. I think with layouts such as these, a certain willingness to discard what came before is almost a pre-requisite. ...instead, the PCB and plate will be available to buy from CandyKeys.com. I met David from CandyKeys at a meetup in Vienna and we discussed the project. He is as enthusiastic about the Katana60 project as I am, so I'm proud announce that we will be working together to bring the Katana60 to the community. This is what it will look like. It will support all the layouts in the compatibility section above. It will be 1.5mm, and I believe it will be brushed steel (David, can you please confirm that). We are awaiting final quotes from various places, but early indications point to favourable prices relative to existing 60% PCBs. This is where it helps to have CandyKeys on board, since they can afford to stock a larger quantity than we could expect to get in a GB, which heps us all! 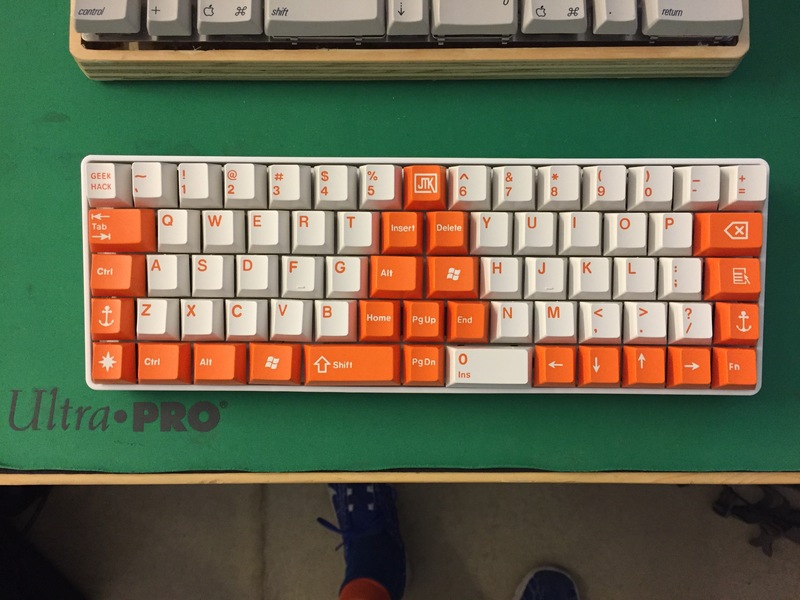 Katana60 with JTK orange on white. Wow, you know what I love about this? ...but in a standard 60% footprint with 100% keycap compatibility, none of that curvy-wavy never-gonna-find-keycaps that fit nonsense. We are as excited as you are Details coming soon on release date and pricing. We will be offering full kits too. Curious how things are going now? I think CandyKeys is a bit busy on GMK Ellipse these days. Not busy at all! We are working hard on CAD drawings for the KATANA case which BTW looks AMAZING. The PCBs are complete, they will be shipped by the end of the week. The Plate prototype pictures are coming soon, we are picking the plates up this week or next week as well. Then the case will take about 3 weeks or more depending on how it goes. 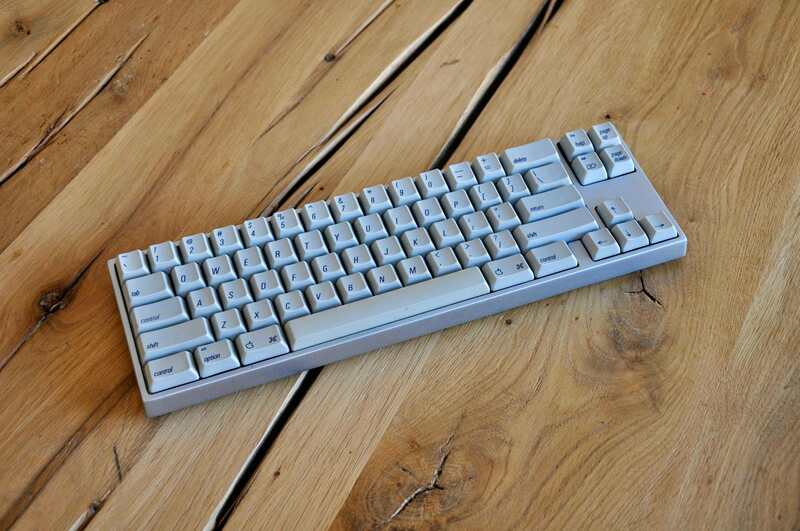 You will be able to select the keyboard with a range of BOX and Speed Kaihl Switches, Gateron Switches and eventually hopefully coming Cherry switches. Prices are still to be confirmed. Page created in 0.149 seconds with 76 queries.